You can now record travel directions on Nokia’s Ovi Maps application in your own voice. Instead of the calm tones of the default speaker telling you to “take the second left at the roundabout” it can now be your own voice telling you to do that. Nokia’s Ovi Maps comes preloaded on Nokia smartphones and include a Walk and Drive navigation which (like TomTom for example) works by talking you through directions. Go somewhere quiet and record the 53 necessary instructions “turn left”, “continue for 100m” and so on and the gadget will use your pre-recorded messages to guide you to your destination. You can also browse and rate other peoples’ voice skins. The app is voice-controlled as well so you ask the phone a question and the phone replies In Your Own Voice. Maybe it’s just me but I find it kind of creepy that you could be lost but that your voice would be able to tell you where to go. I suppose to a causal observer it would be like you having a conversation with yourself. Perhaps not one for those afraid of developing with multiple personality disorder. 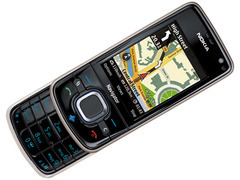 Nokia Ovi Maps comes preinstalled with most Nokia smartphones. Download the Own Voice app that lets you record your voice from the Ovi Store here.